Medicina is located to the east of Bologna. It was probably named after the healing waters of the River Sillaro which furrows its countryside. However, the legend goes that its name comes from the healing qualities of a snake put to boil in the soup of Frederick I Barbarossa. Recovered from his illness, the Emperor called the town "Medicina" (medicine) as a token of his gratefulness. In this area Matilde of Canossa set up the "Partecipanza", a system which distributed lands among the town's families. This system also established the right to hand over rural property only to male heirs. Medicina is worth a visit to admire its beautiful arcades and a magnificent bell tower, both of them dating back to the 18th century. 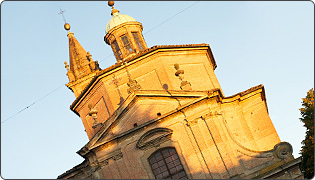 It should be noted that the Church of St. Mamante and Lucia Martini (built in the same period) is located far from the bell tower. This is due to the sharp division of roles between the City Hall - which had the bell tower built - and the Church. The Clock Tower was rebuilt in 1735 on a previous 16th century edifice. On leaving the town, visitors can head towards Imola or towards the nature reserve "Il Quadrone" to admire the herons or to visit the Radio Telescope "Croce del Nord" located in the nearby countryside. Tourists can finally reach the hamlet of Portonuovo to see a beautiful Baroque church built by architect Torreggiani. From Portonuovo you can head towards Argenta or Ravenna. from Bologna and Rimini/Ravenna: take A14 motorway and exit at Castel San Pietro Terme. from Florence: from A1 motorway take A14 towards Padova/Ancona/Bologna Centro/Bologna Casalecchio and exit at Castel San Pietro Terme. Line Bologna-Ancona-Rimini: Castel San Pietro stop.